Engine / Belt Driven Watermakers are ideally suited where the propulsion engine runs more than once a week. They produce 21 - 64 gallons fresh water per hour, even on the smallest yacht without generator. Every time the diesel engine runs, you will produce large quantities of fresh water and charge your batteries at the same time. Adding a watermaker pump to the alternator’s load will also benefit your diesel engine, as it does not like to run underloaded. 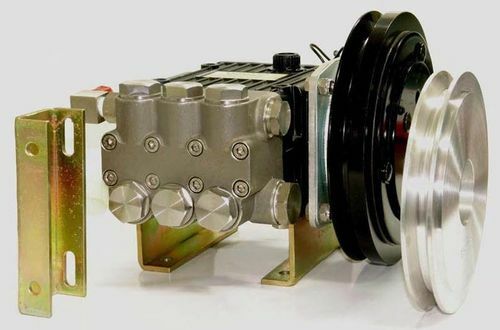 The high-pressure pump mounts on a custom bracket directly to the main engine or generator. An electromagnetic clutch, driven via one A section belt couples the watermakers’ pump to the engine. The supplied U-bracket helps to install the pump on the engine like a second alternator.